If you use the elephant, just call it a Burmese Elephant, which does move just like a Silver. Sittuyin (Burmese Chess) is closely related to Makruk. And the Elephant piece is called a Sin in Burmese, so you can still use the initial S for the piece. I think use elephant symbolic should be good, because acient war is asia use elephant as main attacker and I think Silver move represents elephant move such as it can attack good in front of its but I hardly move backward and it weaks on side. OK, I will use S and M for Silver and Med. One more question. I saw in the playok link you gave a Thai Chess diagrams using non-standard pictograms (similar to the actual piece shape) for all pieces except Knight. In WinBoard / XBoard this can always be done by supplying external piece fonts or bitmaps, and for the built-in bitmaps i would definitely want to stick to the standard representation. E.g. a Thai 'Boat' would use the symbol of a Rook from western Chess, because it is the same pieces. The same applies to Pawn and King. Unfortunately, WinBoard has no separate symbol for the Shogi Silver General, and uses the same symbol for it in Shogi as the Ferz (which is also used in Shatranj and Courier for Queen, and in Xiangqi for Advisor). After all, it is an augmented Ferz, like the Gold General is an augmented Wazir. But this poses a problem in Makruk, where the Ferz and Silver both participate. I'd rather not make new bitmaps; WinBoard has so many already, and they would have to be made for each size separately, etc. So I wanted to represent the Med by the standard symbol in WinBoard for Ferz, and find an alternative for the Silver. My first thought was to use the Elephant, (the WinBoard symbol used in Xiangqi and also for the Shatranj and Courier Alfil), although it moves nothing like the Afil. The only reason is that Shatranj uses Alfils in those locations of the array. So I wonder if this is the optimal choice. Alternatives would be to use the Lance symbol. But this is currently used in WinBoard as a wild-card piece, that can move in any way you want, and I would like to keep it that way. And I had rather only have pieces that WinBoard knows the moves of in not-so-well-known variants, so that people can use the -showTargetSquares option to be reminded of how the piece moves. (Which does not work for the wild-cards). Yet another possibility is to use the WinBoard Commoner symbol, a 'german helmet' with a spike on top. Perhaps this would be best? The standard move of the Commoner is like a King, and the Thai Bishop is a subset of this. And the over-all shape of the helmet with a spike on top is not unlike the shape of the Thai pieces for Bishop, Ferz and King. What would be the most logical choice of letters for representing the pieces of Makruk in the western alphabet, e.g. for writing down a game in PGN? How do the Thai do this? Do they use the letters for the Chess counterparts? Does there exist something like Makruk diagrams, and if so, what pictograms are used. I have seen stuff written about the 'Thai Elephant', and how its move pattern is supposed to represent an Elephant, with 4 legs and a trunk. But I understand that the Thai word for it does not mean 'Elephant' at all. How does Thai software for playing this game represent the pieces on the screen? I hope that someone from Thailand can help me with these questions, as I am currently adding Makruk as a standard variant in WinBoard, and want to know how best to do that. 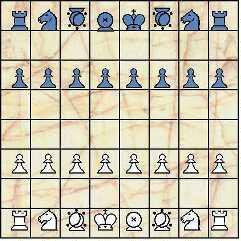 This game is similar to Senterej, Ethiopian Chess, in that you should not bare your opponent's King. In Senterej, however, there are no actual rules concerning bare King; it is merely etiquette. Excellent. The graphic that you just used is the one I had in mind. The 5 dots indicate the movement of a Silver General (from Shogi - which happens to move as does the Makruk Khon (Thon)and the moon is alchemy symbol for silver. Very good. Now the brain doesn't have to make Bishop to Khon conversions. Many thanks. No problem. I'll change it. I found a piece with 5 dots in the direction of movement of the Thai Bishop (I think it may be a wizard?). What's the graphic for a Silver? Give me a game that currently uses it so that I can see it and change it again. Thank you very much for making a new preset. It looks nice, but it would be even better if the Bishops were replaced with Silvers (there is an Alfaerie (sp?) version of them). I am looking to play a game of Makruk. Here is a new preset I just created: /play/pbm/play.php?game%3DMakruk+%28Thai+chess%29%26settings%3DAlfaerie Anyone interested? I just made a nice wood Makruk set over the weekend. Will try to get a photo of it in a day or two. Update: Jpeg images sent to CV on 1 July. I found this link on Thai Chess: http://www.thailandlife.com/thaichess/ which explains the rules of the game, including the rule about how many moves does a player have to checkmate a lonely King before a forced draw. In my Books about Thai Chess is always White starting at first. That means that white/red moves first. The strongest players of Thai chess are all members in the Bangkok Chessclub which is a strong Western Chess Club. Irt is very likely that there are stronger Players as Mr. Tor from Samut Prakarn who is very likely the Number 5 in Thailand. The Club in Samut Prakarn is near the Shuttle Buses to the Crocodile Farm and they are playing there always in the Afternoon. Cambodian Chess is identical to Thai Chess with one exception. The king can jump one time like the castling at the begin from his original field like a knight to th side. Everything else is identical .... as i know. AFAIK, there is a way to decide who move first by guessing the colour of pawn. One player grab a pawn in his/her hand and the other guess its colour and the winner move first. Hi! One more question for Poompat or any native (or thoroughly accustomed) player of makruk: It there a first move rule? That is, does black or white (or red) move first...or is there some other conventional way of deciding who has the first move? I've printed up a booklet of the rules of makruk...and someone asked me this question...but I can't seem to find any answer, on this site, or on any of the makruk sites, or in any of my books. Is there a first move rule? Jean-Louis Cazaux has a page on 'Ouk Chatrang, the Cambodian Chess and Makruk, the Thai Chess' on his web site. Cazaux has a personalid page here, giving the current address of his web site.